Inside the now-bisected lower level at 42nd St. and 8th Ave. Yesterday, as part of the countdown to the opening of the 7 line extension, I took a look back at the lost opportunities at 41st St. that will plague this project until and unless the MTA builds the omitted station. Today, we look at something else the new 1.5 mile tunnel had to cut through to reach the Hudson Yards: an abandoned subway platform underneath 8th Ave. at 42nd Street. The IND’s stop at 42nd St. and 8th Ave. is a funny little quirk of history. It hasn’t seen passenger service March of 1981 and was most famously featured in the movie Ghost in 1990. It’s a one-track, one-platform nearly unique in the system and once served as the staging ground for special Aqueduct service and as a staging ground for certain rush-hour E trains. It’s an odd duck in a system filled with odd ducks. It is, of course, that same 7 crosstown IRT line that signals the death, in part, of the lower level at 42nd St. To build out the train to 34th St. and 11th Ave., the MTA had to construct the tracks directly through the old platform. You can see the tunnel box in the photo atop this post, and I have a few other shots of the old platform from my 2012 tour of the 7 line. You can see where new constructed bisected the old station and where new systems are attached to old. The station is a weird ghost platform that looks like a dystopian version of the platform above it, and it will never see train service again. At least, after over 30 years of sitting fallow, trains will soon begin to pass through this abandoned and barely understood piece of New York City history, albeit more literally than the IND’s builders ever intended. I wonder if it was designed to service never built Rockaway lines as the Queens Blvd subway is littered with half built portals intended for extension to the Rockaways. While at Rockaway Park-116th St I noticed a service sign showing A trains running rush hour to 59 St-Columbus Circle which is not an ideal place to turn trains. Turning Rockaway trains at the lower level 42 St (which would have worked had Rockaway service run via Queens Blvd) would have been better as south of the platform the track merges with both the southbound local and express track through 34 St-Penn Station, south of which is a 5th center track which would be ideal for turning trains. Obviously it was done with crowd control in mind, maybe it was envisioned as a late night terminal, and it is a rather obtuse way to do things but then there is a lot about the IND that wasn’t entirely logical. I might add that at that time there was going to be much more traffic along 8th Ave than coming in from Queens so it may have been a way to service the two most important stops on the line and allow more service to Harlem. 1) Yes, recently there have been rush hour A-trains to Rockaway Park that are said to start at 59th Street-Columbus Circle. Yes, such trains did “start service” there, but that is not the same as saying that those trains terminated and relayed at or near the 59th Street-Columbus Circle station. Instead those trains generally start in Washington Heights near the A-train yard access tracks and travel down the A-line without passengers until the 59th Street station, sometimes such trains also waited on the layup track near 72nd Street until their scheduled leaving time. 2) A look at the track maps available on the NYC Subway.Org website clearly shows that the “extra downtown E-track” has ZERO track or switch connections to any of the uptown tracks in any direction. There is simply no way to use that “extra downtown E-track” to terminate or relay trains. 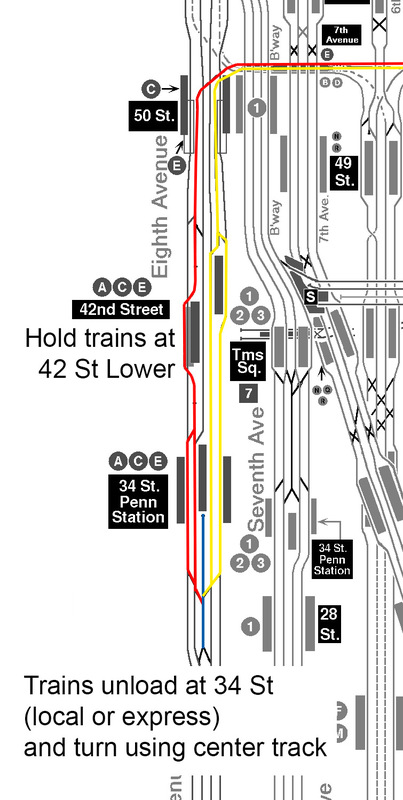 I don’t think I explained my point about terminating at 42nd St so here is a graphic to better illustrate it. The red is Manhattan bound trains terminating at 34th St, blue the turning track, and yellow is Queens bound service. Trains coming in from Queens would terminate at 34th St. What this lower platform allowed was for trains to be held and then routed either via the local or express tracks depending on what was available and what would cause the least backup. Looking at the route I’ve highlighted it’s totally doable. This would be a sensible routing for rush hour trains as it would hit the most important two stations on the line and then turn back. Here’s what you have to think about: this platform didn’t even get put into service until 1959. The Rockaways branch was added in 1956. What this means is that this could have been envisioned as a Rockaway “terminal” for trains coming in from Queens. But when the Rockaways lines started running in from Brooklyn that meant that this platform was on the wrong side for trains to terminate and thus decided to try it for Aqueduct service. I understand your track map, and the points that you’ve raised. Such a routing from Queens is possible, but I could not to find a record of such a plan. That 5th track could also have easily been used as a space for to take ill trains out of service. The builders of the IND system created several 5th-track segments and “extra track” segments that the intended usage of those elements seems lost to time. There were 5th-tracks placed south of 34th Street, south of Canal Street, northeast of Queens Plaza, between Broadway-Lafayette Streets and Second Avenue, along Fulton Street near Lafayette Avenue, north of Utica Avenue, near Smith-9th Street, plus a 5th and 6th track north of 72nd Street and north of 125th Street. The ideas behind the track space at Classon Avenue on the G-train, plus the additional layup tracks at Bedford-Nostrand Avenue on the G-line. What were the designed plans for these tracks, versus their actual usage is an open question. The IND system as built has several features whose origins stemmed from interesting ideas that were not realized, or that changed over the decades. I think the purpose is all of the above. Having those 5th tracks allows you to turn trains without blocking normal service as the T/O changes ends. It’s also handy to hide a bad order train until after the rush hour. Places like n/o 72 allow you to move trains local to express (and reverse) without blocking trains behind while waiting for a gap to open up. It is just general flexibility. And it is always useful, even all these years later. Well Vansh…. you beat me to the punch – I got the same idea a few years ago after staring at at track map long enough. But it’s also worth noting that with this facility (even if actual construction came later) and the offset platforms upstairs to make them wider, someone during the planning stages was expecting huge crowds to be going to this station. Most of those trains start further north. I once boarded a Rockaway Park-bound A train at 168th Street. They usually deadhead south from 207 Yard. Trains from Rockaway Park usually run up to Dyckman Street before heading into the yard. According to the schedule, those (A) trains terminate at 207th Street in the morning, and start at 168th Street in the afternoon (with 1 starting at Dyckman Street). But in past schedules, they’ve terminated at Dyckman Street while starting at 59th Street. while it’s indeed an oft-repeated story, it is difficult to believe that significant amounts of money were spent purely for spite. By the 1930’s, of course, the Depression was in full swing, and surplus money was no more available then than it would be today. Does anyone really think that planning/budgeting was done in so lax a manner that this could have been slipped into the plans with no real justification? But why is it so difficult? Significant amounts were spent build overly wide stations, overly large stations, and provisions to nowhere. The 8th Avenue Line can hardly justify four tracks given the amount of service it sees. West 4th plain sprawls. 59th has a seemingly pointless third platform, and the six-track configuration at Hoyt seems pretty optimistic today. A whole unused set of extra tracks along the F Train in Brooklyn. Some provision even exists for RBB. “Surplus money” was very available. New York was pretty much the only place that had significant plans in place for spending money New Deal thanks in part to Moses and in part due to plans for the IND. Caro says the cost of the IND was roughly double what it should have been, but that might be because of all the provisions and expansive plans they made. BTW, they still want to build that way, and it probably goes a long way toward explaining some of our cost overruns. 8th avenue line was built with the idea that “NYC” will never expand beyond Manhattan and Bronx. Urban decay and arson in the 1970s decimated the population of the Councourse line and 8th avenue line and it never recovered. The West Side IRT recovered in manhattan, but the 8th avenue line never did. Since the 8th avenue line is squashed against Central Park, and nobody lives in Central Park, and with extensive grade timers on both lines (8th avenue is not technically superior to IRT anymore), there is no point of using using the 8th avenue line in Manhattan. If you examine the graphs, when the IND and IRT were built, they were competing with the horse. By the 2000s/2010s, some stations reached their pre-WW2 peak, most stations still aren’t at their historical peak even though NYC has 1 million more people than it did when the IND opened. The IND was correctly sized when it opened. The mezzanines make sense since there is no point of backfilling dirt vs keeping the space open in cut and cover construction. Berlin and Paris, and London to a lesser extent, are a grid of lines, sort of like the ubiquitous american ring interstate around southern cities. NYC subway only becomes a grid in Manhattan, midtown and further south, and North/Central Brooklyn. The “grid” of europeans metros was planned by the IND. There is no 125th street line. Culver shuttle was demolished. No 3/L connection in Brownsville (ignoring that Brownsville is an arsoned out slum). No Utica Ave line. No Concourse extension along Burke/Gun Hill Road. No Rockaway line connecting Queens Boulevard to southern places. Worlds Fair line in Queens was demolished, now Main street supposedly has SBS instead. The Archer Avenue subway did fix the lack of gridding, but the J train goes through decayed areas that dont have the population to support economic activity. Wait, so before the 1970’s, the Concourse Line and 8th Avenue Line were much busier? That would be an interesting piece of history I don’t know about; I like to see evidence that shows that. I thought that competitiveness blinded the minds of the IND designers when they built a line so close to Jerome Ave. It seems that they knew the traffic would justify it. However, I dispute that 8th Avenue has no use. If you need to get between Midtown and Harlem or Washington Heights fast, with less transfers, that line is the best way to go. The IRT on Broadway does have stops that are more conveniently placed, but on 8th Avenue, it’s only 8-10 minutes between Columbus Circle and 125th Street. To me, it’s hard to argue with that. The service patterns were different. The service patterns on the IRT were different too. It doesn’t appear to have horrible ridership even today, but it does appear to scarcely warrant four tracks, with a possible concession to the E Train’s segment. The SAS, on the other hand, probably could use four tracks. A number of years ago the Transit Museum sponsored a series of lectures on the expansion projects. They were held at GCT on the north-east balcony (now Apple’s Genius area). The acoustics were horrible due to the train announcements. During the one on the 7 line extension, the person giving the lecture (I think the project manager) made a comment that the IND was built to accommodate the 7 extension underneath. Afterwards I went up and asked about that since we’ve all heard the conspiracy theory. He confirmed that I heard correctly, the foundation is effectively built as a bridge so a tunnel could go underneath. The obvious next question was why not do that now; the answer was that the tail tracks (I think built in the 50s, but not long enough for the 11 car trains, thus useless) didn’t have the proper grade, and they just did the extension with the minimum necessary. They could have dug out the tail track area, but no one felt any need to keep the lower level. I know it’s common, and fun, to make all sorts of disparaging remarks about government employees, including at TA. But I’ve worked with these people for decades and in fact the vast majority try to do the sensible thing. More so than in the private sector, where it’s all measured in $ profit. But the politicians and budgets often make it tough. Also I would think that by the 1930s it was becoming obvious that the IRT & BMT were going to wind up under city ownership. I believe that the reason why the lower level was finished in the 1950’s has to do with the 1950’s acquisition of the former LIRR Rockaway trackage. This trackage allowed the TA to service Far Rockaway, Rockaway Park, and the Aqueduct Raceway. The lower level “extra downtown E platform” offered the ability to have “Racetrack” special trains at extra fare without compromising the regular operations of the A-train and the rush hours only E trains that serviced the Fulton Street line, and the Rockaways. Just the same way that the additional platforms at the Hoyt-Schermerhorn Streets allowed Racetrack riders a gathering spot to wait for those specific trains. Mike – in support of your previous statements, a few facts. Stan Fischler in Uptown-Downtown notes that the A-train was extended from to its terminal at Euclid Avenue in 1948, and that remained the Brooklyn terminal of the A-train until 1956, when the Lefferts Blvd. terminal became the Queens terminal of the A-train. Mr. Fischler reports TA engineers had been involved with the idea of extending service to the Rockaways starting in 1950, when a fire destroyed an LIRR railroad trestle to the area, and the acquisition of abandoned route started. The heavy work on the trestle began in 1955, and work proceeded until 1956 when subway passenger service was set to start. Between 1956 and 1958, the Rockaway line segments from Rockaway Park, Wavecrest, and Mott Avenue opened. Again, I believe that the lower level refurbishment of the “extra E-train downtown track” in the 1950’s had to do with the Aqueduct Raceway, and the opening of the Rockaway lines in Queens. The lower level at the Times Square station of the Eighth Avenue line, the “extra E-train downtown track” was the launch pad of the A-train Aqueduct Special trains. While there always was an Aqueduct Racetrack back in the day, the current Aqueduct as we know it today (the building) only opened in 1959. That likely was incentive to finish the lower level of 42nd to use it for such trains (until supplanted by the JFK Express). Thank you for posting that history piece. I am a firm believer in persistently and patiently pushing for what you want. The extension’s tunnel has been flattened at the site of the unbuilt station. If we maintain steady pressure on elected officials and show a willingness to accept a viable financing scheme, MTA can plan and build the infill station. Yes it will cost more than it would have otherwise. But it can be done. So now we should put the “spilled milk” behind us and move forward. Replacing the 42nd street shuttle with moving sidewalks, which was proposed once, is a better choice than opening the 10th avenue station. NYC has excessively close stops, 10th avenue is just a waste of passengers time. Closing 5th Avenue on the 7 train would also be nice. The 42nd Bryant park is 1 block from Times Square. 7 train 5th avenue is 1 block from 42nd Bryant Park. Moving sidewalks are better than a city bus in a tunnel (7 train) stopping at every intersection. Also a moving sidewalk under 42nd street can connect to Hudson River ferries, an extension of the 42nd street shuttle to the Hudson River is impossible due to the West Side IRT and Broadway underneath. Pete, it may be just 1 block, but you’d be surprised how many people transfer between the 6th Ave lines and the 7 here. Try walking through the hallway during peak hours and you’ll see why the transfer remains. I expect that the Manhattan stops are the busiest on the 7 line. If the Manhattan boarding/alighting is split across three stops rather than two, then each stop has less delay and the line frequency/reliability will be a bit better. Agreed. If everyone who transfers at 5th Av station for the 6th Av lines now has to get off at Times Square and walk backwards 2 blocks (remember, the 7 train station at Times Square is West of 7th Avenue), the Times Square station would become intolerably crowded. It’s not going anywhere. In the early sixties I often rode the E from 8th and 42nd home to Far Rockaway. During rush hour E’s would arrive (not originate) on the lower level and run express through Brooklyn, bypassing Kingston/Throop and all that. I remember in the 1980’s you had to literally walk down here to cross from the Uptown side to the Downtown side (and vice-versa). Talk about creepy! In those days you also could not transfer for free from the IND to the IRT/BMT at 42nd St.–that long pedestrian tunnel required a token to enter. Does anyone know how deep the tunnel on 41st/10th Ave. is? I’m going to guess and assume that it’s pretty deep. The stop at Times Square is far underground but I can’t find exact numbers anywhere. My point is: Is this what people want? A deep subway station with entrances a block away from the street it runs underneath??? Also, is the station for convince or to actually speed up someones commute? I’m assuming it might not trim anyone’s commute . It’s useful if you take the IRT subways and maybe the BMT Broadway line but other then that, one will waste time navigating through the endless passages to systems that never planned on merging. My final point: Should the city/MTA built this station solely for tenants of these apartment buildings? I keep see everyone saying that thousands of units are being built and that a station is needed for them, but if tenants are okay paying 3k++ in rent and the developers are building with subway access, then we should anyone else care? Don’t get me wrong, we definitely need more subways, stations etc…. but at expense of future generations to pay this debt?? Also, $800 million is insane for this type of work that like a $400 million project. Bring costs down at least. 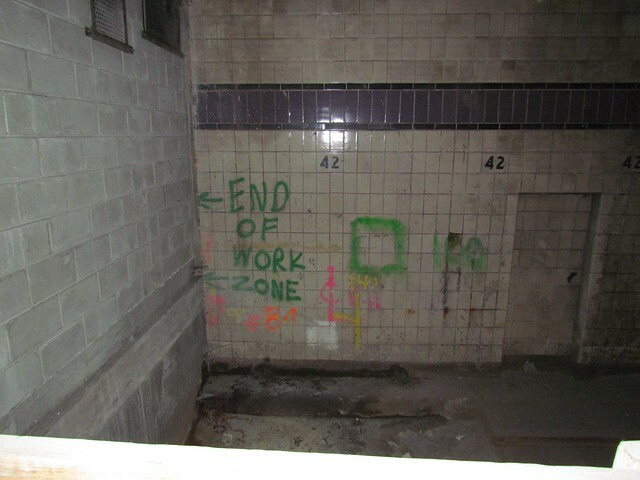 Someone posted a photo online about a decade ago, when the first work started on the 7 extension, which showed two doors on the lower level platform opened up directly onto the bumper blocks for the Flushing Line. Before then, I had thought based on the level of the Times Square station, that the Flushing Line might be a half or one level below the IND lower 42nd platform, though the tracks for the 7 do appear to rise a little bit between Seventh and Eighth avenues. Except for the fact that the city’s #1 priority seems to have been on ruining the BMT and especially the IRT, with tearing down the Els to bring back sunlight to the streets used as justification. Had the IND focused on spending their money well (read: constructing subways where they were actually needed, instead of replacing otherwise perfectly fine Els), then the city may have looked a lot better. But then again, the IND wouldn’t have a raison d’être and it would probably have involved new contracts with the BMT and IRT for expanding their network, and likely a clause allowing them to increase fares concurrent with inflation. There are times when transit fans have to look at what’s happening above the ground to understand what’s happening below the ground. Why was the Sixth Avenue line built as a part of the first IND System? Why were there continual pushes to enhance Sixth Avenue, and to make it the “center of the world”? In addition to various land use and zoning bonuses, and similar decision making. Think the Chrystie Transit Improvement projects was just about having the D-train travel to Coney Island? Anyone heard of Rockefeller Center, and Radio City Music Hall? Money, real estate and finance – plus the dealers and wheelers behind the scenes figure into a lot more of the transit and transportation decisions in NYC than many folks give credit towards. There’s a little more to it than that, including allowing Brooklyn trains to head to Midtown without being restricted to the Broadway lines. I think supporting Rockefeller Center is not reason enough to explain the existence of the 6th Av line and the Chrystie St. Connection. When Hyland first proposed the IND, he was thought ridiculous. The IND survived in part because it brought people from uptown and the outer boroughs to Sixth Avenue and by Rockefeller Center. Sixth Avenue is also the heart of the Midtown Business District. What notable companies have their headquarters or major assets on Second Avenue in Midtown? There was no way it would have made sense to build the Second Avenue Subway before the Sixth Avenue Subway. The reason why the Sixth Avenue Subway made the IND Phase One is because it brought people from the Bronx, Upper Manhattan, Queens, and Brooklyn to Rockefeller Center. The Rockefellers supported the IND for this very reason. Do I remember correctly that the “Train to the Plane”, that operated from 42nd Street to Howard Beach was accessed from that lower level. According to Wikipedia, and my memory (hazy as it is), the JFK Express operated from 57th Street-Sixth Avenue, then down the Sixth Avenue on the local tracks to West 4th Street, then along the AA/CC/E local tracks to Canal Street, then on the A-train tracks to Fulton Street, Jay Street and then to Howard Beach. One aspect of the JFK Express was that riders in Brooklyn were better off simply taking the Rockaway bound A-trains to the Howard Beach station for the airport bus than traveling to downtown Brooklyn-Jay Street for the JFK Express. Some folks from Howard Beach, it was said, used the JFK Express and its higher fares as a way to speed their travel times, to have a less crowded train ride, and to reduce encountering riders from Brooklyn or the Rockaways. My memory tells me that the JFK Express did NOT use the 42nd Street-Eighth Avenue station. The JFK Express for most of its life started at 57th Street-6th Avenue and of course went to Howard Beach. When the extension to 21st-Queensbridge Plaza opened in October 1989, the JFK Express began going there (also stopping I believe on Roosevelt Island and 63rd/Lexington), making it for a time the only subway line to start in Queens and finish in Queens while going through Manhattan and Brooklyn. The line always used 6th Avenue to West 4th and 8th Avenue south of there. Wow to all of the above. I’m more familiar with the Philadelphia system.